When you’ve dropped serious money on a motorcycle, you want to keep it in good condition. For most cycling enthusiasts, that means storing it in a car garage when not in use to protect it from sun, rain, wind, humidity and theft. But if you don’t have a garage, you still have options for keeping your motorcycle protected. CarRegistrationAdvisors.org knows you want to keep your bikein top condition for as long as possible. 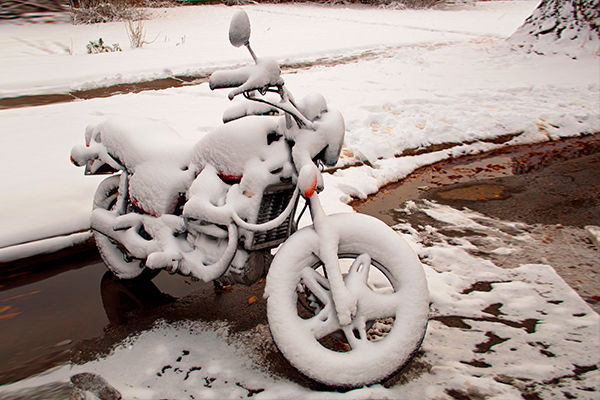 Here are some basic tips for keeping your motorcycle safe from the elements and other people when you don’t have a garage at home. When you store your bike outside, it’s exposed to wind, rain and sun pretty much constantly. That can lead to rust, decay and paint damage over time. One easy way to protect your motorcycle is to purchase a suitable bike cover for it. Covers are available for anything from $8 to $88, so you have a lot of options available. CarRegistrationAdvisors.org recommends you shop around and look for a cover that seems durable and adequately sized for your ride. Make sure to put it on every time you get off your bike. You can even keep it with you to cover your bike whenever you park while traveling. Motorcycle enthusiasts often suggest using a cover that looks like it belongs to a cheap or old cycle. If you’ve got a nicer bike, an older or more worn cover can minimize the chance your motorbike catches a thief’s attention. If you have to park your bike outside, you may as well secure it. There are multiple kinds of bike locks available. If you’re in a high-risk area, it may be worthwhile to invest in a series of locks to have a secure backup system. CarRegistrationAdvisors.org recommends investing in a portable, heavy-duty disk lock that you can easily install wherever you go, as well as a high-quality cable lock and a grip lock. No locks are infallible, but having multiple levels of protection significantly improves your chances of keeping your bike. Research the available motorcycle locks on the market, and get the most high-quality locks you can afford. Hands down, the best method of protecting your bike is waxing it regularly. Carnauba wax or paint sealant will seal your bike so that rain, snow, dirt and other potential sources of damage are repelled. Carnauba wax is also famous for the beautiful, shiny finish it provides, which means your bike will be a looker for longer. The team at CarRegistrationAdvisors.org suggests you wax your bike every two to four months if you’re using carnauba wax, or every eight to nine months if you’re using a paint sealant. Finally, if you don’t have a garage to store your motorcycle in, you always have the option of buying one. A storage shed isn’t necessarily exactly the same as a garage, to be sure. But it does provide protection from the elements, including wind, and another level of anti-theft protection. Not everyone has the space to purchase and install a storage shed, of course. But a shed is cheaper than a garage so if you’ve got room, the CarRegistrationAdvisors.org team advises making the purchase. Storage sheds run a few hundred dollars. Depending on the price of your bike, that could certainly be a worthwhile investment.